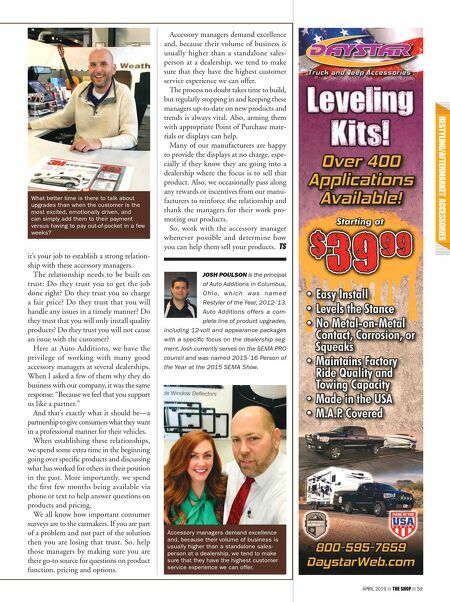 APRIL 2019 THE SHOP 59 it's your job to establish a strong relation- ship with these accessory managers. The relationship needs to be built on trust: Do they trust you to get the job done right? Do they trust you to charge a fair price? Do they trust that you will handle any issues in a timely manner? Do they trust that you will only install quality products? Do they trust you will not cause an issue with the customer? Here at Auto Additions, we have the privilege of working with many good accessory managers at several dealerships. When I asked a few of them why they do business with our company, it was the same response: "Because we feel that you support us like a partner." And that's exactly what it should be—a partnership to give consumers what they want in a professional manner for their vehicles. When establishing these relationships, we spend some extra time in the beginning going over specific products and discussing what has worked for others in their position in the past. More importantly, we spend the first few months being available via phone or text to help answer questions on products and pricing. We all know how important consumer surveys are to the carmakers. If you are part of a problem and not part of the solution then you are losing that trust. So, help those managers by making sure you are their go-to source for questions on product function, pricing and options. 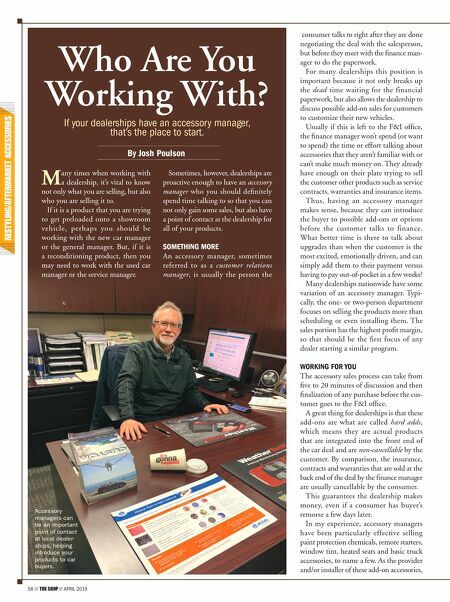 Accessory managers demand excellence and, because their volume of business is usually higher than a standalone sales- person at a dealership, we tend to make sure that they have the highest customer service experience we can offer. The process no doubt takes time to build, but regularly stopping in and keeping these managers up-to-date on new products and trends is always vital. Also, arming them with appropriate Point of Purchase mate- rials or displays can help. Many of our manufacturers are happy to provide the displays at no charge, espe- cially if they know they are going into a dealership where the focus is to sell that product. Also, we occasionally pass along any rewards or incentives from our manu- facturers to reinforce the relationship and thank the managers for their work pro- moting our products. So, work with the accessory manager whenever possible and determine how you can help them sell your products. JOSH POULSON is the principal of Auto Additions in Columbus, O h i o , w h i c h wa s n a m e d Restyler of the Year, 2012-'13. Auto Additions offers a com- plete line of product upgrades, including 12-volt and appearance packages with a specific focus on the dealership seg- ment. Josh currently serves on the SEMA PRO council and was named 2015-'16 Person of the Year at the 2015 SEMA Show. What better time is there to talk about upgrades than when the customer is the most excited, emotionally driven, and can simply add them to their payment versus having to pay out-of-pocket in a few weeks? Accessory managers demand excellence and, because their volume of business is usually higher than a standalone sales- person at a dealership, we tend to make sure that they have the highest customer service experience we can offer.